BRACEBRIDGE — A prayer vigil tonight to remember the 50 people killed in the New Zealand mosque massacre was personal for Muna Bek. Muna Bek gets a hug at tonight’s prayer vigil at BMLSS, attended by 85 loving supporters. She lost a friend and his son in the shooting — Khaled Haj Mustafa, 44, and his son, Zaid, 14. Bek knew them from Jordan, where they were Syrian refugees together for four years, before moving to opposite corners of the world. Bek to Bracebridge, the Mustafas to Christchurch. Salwa Tsay was the wife and mother to the two victims — and a son, 13, who was injured. She and Bek were among 12 women who stayed in contact on social media through What’sApp. That’s where Bek first learned of their deaths. They had all lived together four years after fleeing war-torn Syria. 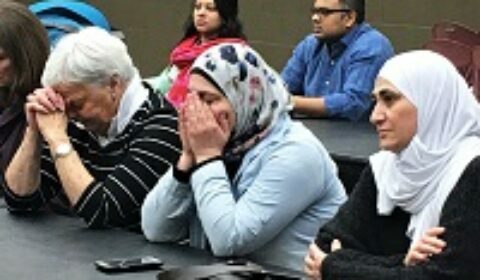 At the Bracebridge high school cafeteria Thursday night — where 85 Muslims and their Christian friends paused for a minute — there was an oneness that enveloped them in purpose and place. And as Bek’s brother, Adham, read the names of those killed, heads were hung, hands clasped on foreheads and tears wiped from eyes. For Muna Bek, the popular matriarch of the Muskoka Muslim community, the evening’s simple but heartfelt proceedings were appreciated. She said the past week has been very emotional for her. “At first, I was afraid to go out,” she said before the vigil. People reached out and she received cards of sympathy. “It was very beautiful,” she said. Pam Hough, left, Fatenah Hajqorban and Muna Bek pause during reading of the victims’ names. It was why, said her brother, that he couldn’t convince his sister, a single mom with three big boys, to move to Markham to join him and his family. Feelings of peace and love echoed around the room as the mostly older crowd came to “understand the commonalities” of the Christian and Muslim faiths, said MC Trisha Cowie. Rev. Dr. GailMarie Henderson, the Anglican Parish of Muskoka Lakes minister, began by briefly describing the “horrors” of what happened. Members of Muskoka refugee committees were prominent among those paying their respects with hugs and touches of reassurance for the Syrian families who moved here two-and-a-half years ago. Guest speakers Rev. GailMarie Henderson and Imam Ismail shared a moment after the prayer vigil. He said “there is no reason for the gunman” to kill those 50 people. It’s the same with “humanity” he said. Everyone feels the pain. “We reject it and feel united by it. Speaker Ali Usman, a teacher in Barrie, said despite their commonality, Muslims and Christians and all faiths, don’t “talk and interact” enough to understand each other. He urged them all to reach out to one another. “Muslims believe there is one creator and one creation” they should all share. And he brought a number of pamphlets and small booklets about Islam and Muslim teachings, which many picked up from a table. Also on the table was a “prayer box” where people could write notes that would be sent to Christchurch. A ‘prayer box’ let people sent messages that will be delivered to Christchurch from Bracebridge and Muskoka. Joanne Brown, of Bracebridge, was among those who wrote a note. “I’m a practising Christian. … We need more peace” in the world, she said. She called the night a “captivating” experience, in which she said she learned a lot from Usman’s lengthy lecture as part of the hour-long vigil. “It was an opportunity for us in Bracebridge, in our clubs, to engage in the conversation. “We all need to be out in our community” talking. Ghswan Malem, a Canadian Tire worker in Huntsville, who came to Canada at the same time as Muna Bek, said while he hasn’t had anyone offer their sympathies or condolences, he said people are talking about what happened. Pam Hough, a member of the Syrian refugee community that’s in hiatus right now, said she, too, was moved by the night. She has adapted well, and runs a small sewing business out of her home. “She is a professional sewer (seamstress),” boasted her sister-in-law Fatenah Hajqorban, who came up from Markham with a number of other Muslim community members to offer support. If part of the vigil’s goal was as much about understanding as love — and bridging a gap — it accomplished both. But then, they were preaching to the converted. Bracebridge residents Sabina Mahmood and little Xavian Hafiz, 7 months, were surrounded with lots of love. It was a moving service that had many bowing their heads and remembering the grave tragedy in Chirstchurch last Friday. The cafeteria at the Bracebrdige high school was filled with supportive members of the Muskoka community. About 85 people, including some from Markham, came to hear the speakers and pay their respects Thursday night. A number of people picked up free pamphlets and booklets about Islam after the service.